WASHINGTON First Lady Hillary Rodham Clinton will host a White House ceremony July 29 at which she and Postmaster General William Henderson will officially issue a postage stamp to help raise funds for breast cancer research. 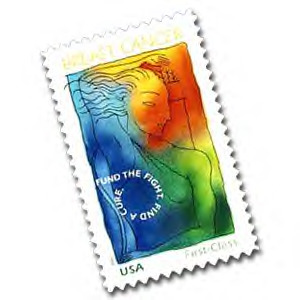 The Breast Cancer Research stamp is the first U.S. stamp in history to have its net proceeds above the cost of postage earmarked for research organizations. "About 2 million American women suffer from breast cancer today," said the First Lady. "This deadly disease, which claims a womans life every 12 minutes, has touched the lives of so many American families, including the Presidents own. I am proud to build on the Presidents long-standing commitment to breast cancer prevention and research. This historic stamp will be invaluable in our efforts to increase research funding and save lives." "The Postal Service is honored to have the First Lady dedicate this very special stamp," said Postmaster General William Henderson. "Mrs. Clinton is supporting our national commitment to funding the fight against breast cancer and to finding a cure, and we want this stamp to play an important part in the fight." Henderson said the Postal Service will print 200 million stamps, and hopes every stamp will be bought and used. The Breast Cancer Research stamp will be available in the Washington, DC-area on July 29, and available at post offices nationwide the next day. Following the July 29 issuance of the Breast Cancer Research stamp, the Postal Service, breast cancer organizations and other groups will participate in awareness events at various locations and times up to and through National Breast Cancer Awareness Month in October. As a "semipostal" stamp, it will cost 40 cents and will be valid for postage in the amount of the prevailing 32-cent First-Class letter rate. Seventy percent of net proceeds above the cost of postage will be given to the National Institutes of Health (NIH), and 30 percent of net proceeds above the cost of postage will be given to the Medical Research Program of the Department of Defense (DoD). The NIH and DoD, which both conduct breast cancer research, were identified as recipients of the funds by legislation enacted in 1997. The self-adhesive Breast Cancer Research stamp is a nondenominational stamp, bearing the words "USA" and "First-Class." The background of the vertically formatted stamp design features overlapping areas of pastel blue, yellow, orange and green. Along the top are the words "BREAST CANCER." A black line drawing of a female figure, suggesting a "goddess of the hunt or fight" is the main element, while the phrases "FUND THE FIGHT. FIND A CURE." appear flowing left to right across the stamp in a clockwise, circular pattern, outlining where the figures right breast would be. The stamp was designed by Ethel Kessler of Bethesda, Md., and illustrated by Whitney Sherman of Baltimore. This is the first postage stamp illustration by Sherman, and is the first stamp design completed by Kessler, one of six art directors developing stamp designs for the Postal Service. Kessler has a personal interest in helping raise awareness about breast cancer since she is a survivor of the disease. For six decades, the Postal Service has issued new stamps to help raise awareness for a variety of health and social issues including drug abuse, AIDS, and environmental protection and conservation.